Your inner history buff will appreciate Rock Church and The Esplanadi Park. 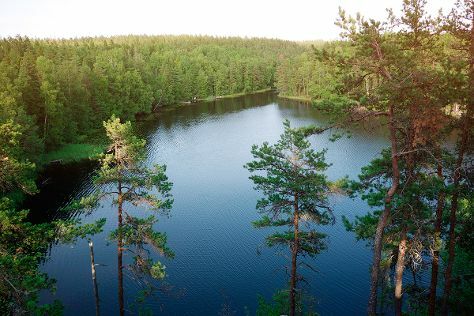 Take a break from Helsinki with a short trip to Nuuksio National Park in Espoo, about 46 minutes away. There's much more to do: learn about all things military at Sea Fortress Suomenlinna, make a trip to Senate Square, take in the spiritual surroundings of Kamppi Chapel of Silence, and wander the streets of Ullanlinna. For maps, traveler tips, reviews, and other tourist information, read our Helsinki holiday maker site . Wuhan, China to Helsinki is an approximately 20-hour flight. The time zone difference moving from China Standard Time to Eastern European Time is minus 6 hours. Prepare for colder weather when traveling from Wuhan in May: high temperatures in Helsinki hover around 18°C and lows are around 7°C. Wrap up your sightseeing on the 5th (Sun) to allow time to take a train to Tampere. Finland's third largest city, Tampere boasts an array of cultural offerings and a lively music scene. Start off your visit on the 6th (Mon): soothe aching muscles at some of the top local wellness centers, kick back and relax at Rauhaniemi Beach, then take in the spiritual surroundings of Tampere Cathedral, and finally take in the architecture and atmosphere at Church of St. Alexander Nevsky and St. Nicholas. On your second day here, tour the pleasant surroundings at Riihiniemen Uimaranta, look for all kinds of wild species at Hatanpaa Arboretum, and then steep yourself in history at Amuri Museum of Workers' Housing. To find ratings, more things to do, other places to visit, and tourist information, read our Tampere trip maker tool . Traveling by train from Helsinki to Tampere takes 2 hours. Alternatively, you can drive; or fly. May in Tampere sees daily highs of 17°C and lows of 4°C at night. Cap off your sightseeing on the 7th (Tue) early enough to travel to Rovaniemi. Kick off your visit on the 8th (Wed): get engrossed in the history at Arktikum, then Head underground at Syvasenvaara Fell, and then take an exotic tour of a safari tour. Get ready for a full day of sightseeing on the 9th (Thu): find something for the whole family at Santa Claus Village, then see Santa Claus Office, and then fly down the slopes at Ounasvaaran Hiihtokeskus Oy. To find other places to visit, maps, ratings, and more tourist information, use the Rovaniemi day trip planner. You can do a combination of train and flight from Tampere to Rovaniemi in 5 hours. Other options are to fly; or drive. Expect slightly colder weather when traveling from Tampere in May: highs in Rovaniemi hover around 12°C, while lows dip to 3°C. Cap off your sightseeing on the 9th (Thu) early enough to travel back home.